A vital artery into Bristol city center Stokes Croft joins the Broadmead and Cabot Circus shopping districts at St James Barton Roundabout (with it’s underpass known locally as “the Bear Pit”) up to Cheltenham Road and Gloucester Road with its bustling student populations. It’s a busy commuter route with shoppers, office workers and public buses which see’s thousands of people walk its streets daily, and is home to many diverse communities, businesses and creative individuals. Stokes Croft is an area that has not undergone the kind of development that has shattered community elsewhere in the centre of our City. The lack of investment which previously allowed the area to become derelict has conversely allowed it to blossom into a shining example of grass roots community restoration, which many argue is a much more sustainable and healthier approach to redevelopment. Stokes Croft is becoming globally renowned for its street art, and for its determination to become an exemplar for best practice for how community can determine its own future. 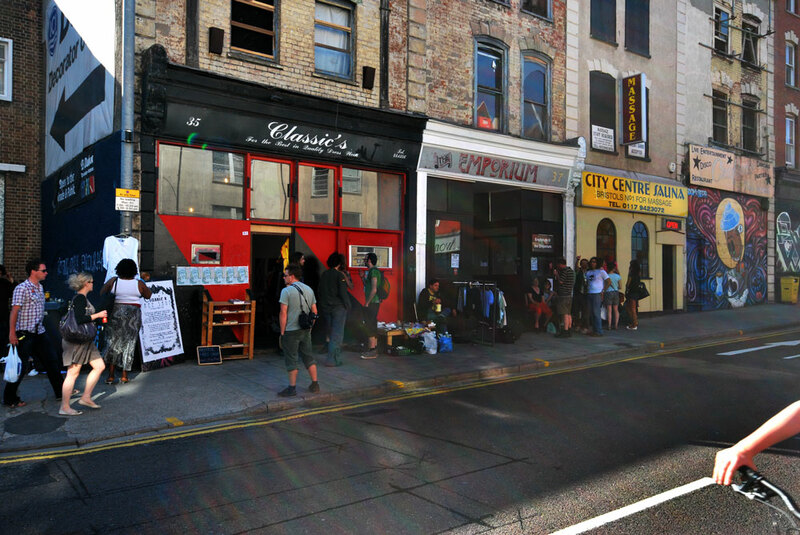 Below: The Classics Freeshop, a community-run building in the heart of Stokes Croft which offers a hub where people can leave unwanted stuff for others to take and use. Apart from the occasional donation, no money changes hands. Next door, the Emporium Art Gallery, also community run, which has offered a free exhibition space to local artists for the last two years. Currently facing eviction from absentee landlords who have left the property derelict for over 20 years. Check out www.prsc.org.uk for more information about this ground breaking area.